Violet Food is a fertilizer specifically formulated for African Violets. A good Violet Food should have approximately equal amounts of the primary nutrients: nitrogen (important for growth of leaves and stems), phosphorus (aids to develop healthy roots and flowers) and potassium (gives the plant energy to grow). These elements are normally found on the front label and will appear, for instance, as 14-12-14. 14-12-14 is the recommended formula for standard African Violets, such as those grown in 3-inch pots or larger. For growing Optimara miniatures (2-inch pots or less) a Violet Food or Miniature Plant Food with a 7-9-5 NPK is recommended. When choosing a Violet Food, make sure that it is 100 percent water soluble. Soluble powders and concentrated liquids are most often recommended. Quick-release fertilizers are preferred to time-release fertilizers (also called slow-release or controlled-release fertilizers). To avoid overfertilizing and the problems associated with it, always follow the instructions provided with your fertilizer. It is important to drench the soil about four times a year (or about every three months). This will wash away any excess fertilizer salts that have accumulated in the soil, restoring the proper balance of the elements that African Violets need. 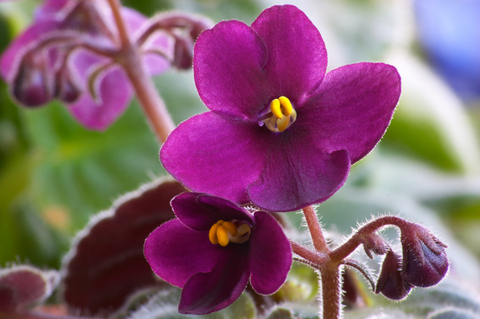 Many fertilizers that have been labeled for African Violets, in fact, contain impurities that can be harmful to Violets. Urea, for instance, is a commonly used source of nitrogen. While it is often cheaper to use than other sources of nitrogen, urea is known to cause Root Burn on African Violets. When selecting a fertilizer suitable for African Violets, make sure that it does not contain urea nitrogen.